Loki, the son of 2 giants, was the trickster god in Norse mythology who was always doing his best to cause trouble. 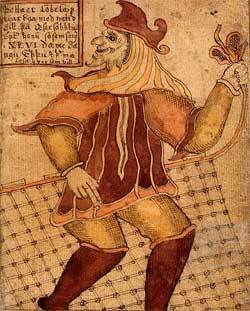 Loki, the son of 2 giants, was the trickster god in Norse mythology who was always doing his best to cause trouble. His wife was Sigyn, who bore him 2 sons, Vali and Nari (or Narvi), though he had an affair with the giantess, Angrboda, who bore him Fenrir, Hel, and Jormungand. In one story, Loki aids in the theft of Idun’s Apples, which insure that the gods don’t age. One day, Odin, Loki, and Honir crossed into Midgard for the day but had not brought any food with them. Loki decided to hunt and kill an ox, but when they tried to cook the meat, it remained raw. An eagle from above told them if they let him eat his fill, the meat would cook and they would be able to eat it. They agreed, but Loki was very hungry and soon grew impatient. He rammed his staff into the bird’s body, so that the bird dropped the meat, but Loki was unable to let go of his staff. The eagle took off and flew just close enough to the ground to drag Loki across Midgard’s floor, and only stopped when Loki agreed to bring Idun and her apples out of Asgard. Loki realized that the eagle was a giant in disguise, and agreed to the task. Loki found Idun and convinced her that he had found a tree that grew apples similar to hers just outside of Bifrost. She followed him out of Asgard, only to find the giant Thiazi in the form of an eagle, who promptly carried her and her apples away. When Idun didn’t arrive to give the gods her apples, they became anxious and began to grow old. They, however, did realize that Loki was missing from their company, and suspected that he was somehow responsible for this fate. Odin summoned Loki, who explained how the eagle would not let him go unless he agreed to bring Idun out of Asgard. Odin then threatened that if Loki did not help return Idun, they would kill him. 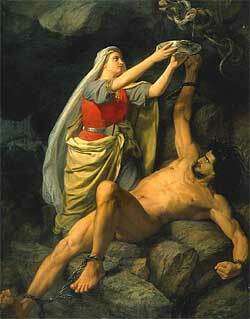 Loki agreed to Odin’s request if Freyja would lend him her falcon skin. She gave it to him, and he flew to Thiazi’s home in Thrymheim, where he discovered Idun. He then changed Idun into a nut and carried her off. Meanwhile, Thiazi, who had been on a fishing trip with his daughter, Skadi, came home to find Idun missing. He knew someone must have helped her escape, so he began flying and soon caught up with Loki as he drew closer to Asgard. Odin was watching all of this and told the gods to take all the fire wood shavings they could fire out of Asgard and pile it as high as they could. After Loki had successfully past over Asgard’s wall, they lit the shavings. Thiazi could not stop himself, flew into the fire, and dropped to the ground in torment, where the gods quickly killed him. Loki then changed Idun back and she offered the gods her apples. Another of Loki’s pranks was to cut off Thor’s wife, Sif’s hair while she was sleeping and left it in a pile on her bedroom floor. When she awoke and realized what had happened, she immediately knew only Loki could have done it. To make up for it, Loki promised to replace her hair with help from the dwarfs. Thor threatened that he had better or he would smash every bone in Loki’s body. Loki made his way to the land of the dark elves and sought out the sons of Ivaldi. He explained that he needed them to spin gold as fine as Sif’s hair and imbue it with magic so that it would grow on her head. In return, he promised them the thanks of Sif and Thor, and all the friendship of the gods. The dwarfs agreed to the bargain, and created the hair. They then decided that it would be foolish to waste the fire, so they created a ship for Freyr called Skidbladnir that could be dismantled until they were no larger than a piece of cloth, and a spear for Odin called Gungnir that would never miss its mark. Loki thanked them and made his way back. On his way, he had an idea to visit the dwarf brothers Brokk and Eitri. He showed them his treasures and challenged them to make something of finer craftsmanship. He told them he would stake his head on it. The dwarf brothers were eager to take up the challenge. They created a boar with bristles of gold for Freyr called Gullinbursti that could outrun any horse and was always surrounded by a brilliant light, an arm-ring of solid gold for Odin called Draupnir that would drop 8 rings of its own weight on every 9th night, and an iron hammer for Thor called Mjollnir that could never be broken and would always return when thrown. Brokk ended up using his brothers awl because his own knife was not sharp enough to pierce Loki’s lips. Once completed, Loki ran out of Gladsheim and ripped the leather thong out of his lips. The most famous story concerning Loki is his role in the death of Odin and Frigg’s son, Balder. Balder began to have dreams of terrible things happening to him. Odin disguised himself as Vegtam, son of Valtam, and entered Hel to seek out a seeress to interpret the meaning of the dreams. The seeress explained that the dreams meant someone would soon kill Balder. Alarmed at the prophecy, Frigg traveled throughout the 9 worlds to get each and every substance to swear an oath that it would not harm Balder. Everything she asked agreed, and the gods tested this by casting a pebble at Balder, who admitted that he couldn’t even feel it. Soon, the gods tried other tests such as throwing darts or stones at him, hitting him with axes and slashing him with swords. Nothing harmed him. This soon became a game among the gods, who rejoiced that nothing could harm him. Loki, however, watched in disgust. He grew envious of Balder, and refused to take part in the games. Then, one afternoon, an idea occurred to him. When he was sure that no one was watching, he changed himself into an old woman and went to seek information from Frigg. Once there, the old woman began to question why they were stoning a man outside. Frigg explained that it was a game, and that nothing could hurt Balder. After awhile, she grew irritated with the old woman’s inquiries, and finally mentioned that only one thing did not swear an oath not to harm Balder, the mistletoe. Thrilled that he had finally found something that could harm Balder, Loki quickly made his way west of Valhalla and grabbed some mistletoe. He then sharpened one end of it and carried it back to Gladsheim, where the gods were so caught up in their game that they did not notice Loki come back in. Loki looked around and noticed Balder’s brother, Hod, who was blind, standing aside. He went up to him and asked why he wasn’t participating in the game. Hod replied because he couldn’t see where Balder was, nor did he have a weapon to throw at him. Loki then gave Hod the mistletoe and guided his arm. It struck Balder, pierced him, and passed right threw him. Balder fell on his face, dead. The gods looked around and knew only Loki could be responsible. After much weeping, Frigg asked if anyone would be willing to travel to Hel and beg for Balder’s life. Odin’s son, Hermod stepped forward, and was soon off. For 9 nights he rode until he reached the underworld and met with Hel. He told her of the grief of the gods and asked Hel to let Balder return with him. Hel told him that if everything in the nine worlds, both dead and alive, would weep for Balder, she would return him to Asgard, but if even one thing would not mourn, Balder must stay in Niflheim. Hermod then left the underworld and told everyone at Gladsheim what had been said to him. The Aesir sent messengers to everything throughout the 9 worlds asking them to weep for Balder. Everything they asked wept. As they were making their way back to Asgard, they came across the giantess, Thokk, sitting in a cave. They asked her to weep, but she refused. The messengers left mournfully, knowing that Thokk was actually Loki. After some time went by after Balder’s death, Loki realized that his days in Asgard had come to an end. He fled to a deserted part of Midgard near Franang’s Falls and built himself a house with 4 doors, one in every direction so that he could keep watch in every direction. One evening, he heard voices coming, so he quickly put out his fire, turned himself into a salmon, and slid into Franang’s Falls. Unfortunately for Loki, when Odin sat in Hlidskjalf, nothing escaped his sight. Odin quickly sent a party of gods from Asgard to capture him. Thor and the others dropped a net into the Falls and weighted it down with stones so that nothing could swim under it. Loki attempted to jump over the net, but Thor caught the salmon and would not let go. As punishment, Thor and one group of gods led Loki to a cave while another party went in pursuit of his two sons, Vali and Narvi. They changed Vali into a wolf and watched as he ripped Narvi’s body apart before running away towards Jotunheim. They then took Narvi’s entrails and made their way to the cave. Loki was promptly bound to a rock using Narvi’s entrails, which became as hard as iron. Then Skadi positioned a snake above Loki so that its venom would drip into his face. There the gods left him. Loki’s wife, Sigyn, stayed behind holding a bowl over Loki’s face to catch the venom. Whenever it is full, she carries it away and empties it into a rock basin. Loki is then left unguarded and the poison splashes into his face. It is here Loki will remain until Ragnarok when Loki will be freed. He will then meet Heimdall, and each will kill the other.